The Indianapolis Colts traveled to Arrowhead Stadium to take on the Kansas City Chiefs in hopes of upsetting the AFC’s No. 1 seed in order to make their way to the AFC Championship Game next weekend. The Colts ‘1-0’ mantra had been serving them well thus far as they’ve ripped off 10 wins in their last 11 games, but this wasn’t anything like any of those games before. In the elements created from the winter storm that came through, the Colts and their offense sputtered out of the gate going three-and-out on their first two drives while the Chiefs came out hitting on all cylinders on their first two possessions to grab the big early lead in front of their exuberant crowd. The Colts eventually got on the board via a blocked punt that was recovered in the end zone, but that was about all the Colts had to show for their efforts in the first half. The Colts weren’t much better in the second half either, and though they were able to move the ball far more effectively, it was far too little, far too late. In fact, Justin Houston’s sack on Luck late in the third quarter may have even put the final nail in the Colts’ coffin. 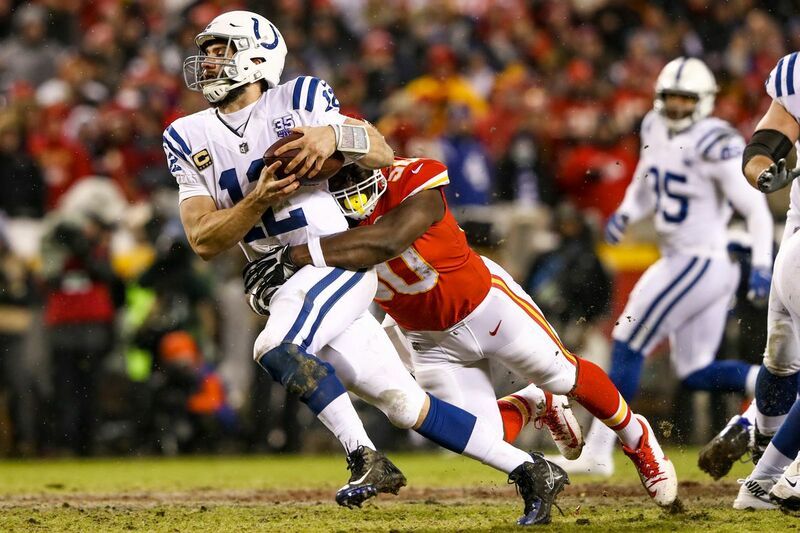 In the end, the Chiefs put an end to the Colts’ magical run and ended their season in this 31-13 mismatch in the Divisional Round. Fortunately, though, Colts fans can proudly, say “I can’t wait until next year!” with confidence. We all knew that the Colts defense was going to be susceptible to the combination of Travis Kelce and Patrick Mahomes given their heavy zone looks. Whether the Colts were allowing that connection to play itself out, and attempt to just lock down the rest of the Chiefs’ playmakers or not, that absolutely did not work. Tyreek Hill gashed the Colts for a long 36-yard touchdown run, Damien Williams ran down their throat and put up another score on the ground, and Sammy Watkins was a thorn in their side as well. But, there’s no question that Kelce’s play, especially in the first half, opened up the entire Chiefs’ offensive playbook for the remainder of the game. Kelce put up 93 receiving yards on the Colts’ defense in the first half, and ended with 108 yards on just 7 receptions. Batted balls at the line of scrimmage, Marlon Mack getting tackled behind the line of scrimmage, and Eric Ebron running his third-down route short of the sticks all led to the Colts going three-and-out on their initial four first half possessions. That’s truly pathetic football. 12 plays and just over 6 minutes worth of possession in the first half. The Colts did manage to get the ball moving inside of the 2-minute warning rattling off 4 first downs as they were racing the clock with no timeouts remaining. However, they set up Adam Vinatieri for a field goal attempt with just a few seconds left in the first half, but it was all for naught as his kick was no good. The Colts offense wasn’t much better in the second half, and may not have really been better at all with all things considered. They couldn’t do anything against one of the league’s worst defenses, couldn’t sustain drives, couldn’t get the ball out quickly, they were much more leaky up front in the trenches than they’ve been this year, and the unit just seemed very out of sync all night long. Yes, the Colts earned a handful of sacks throughout the night. But, no, the Colts did not get much pressure on the presumptive league MVP at all throughout this Divisional matchup. Jabaal Sheard earned a legit sack after winning off the edge in the second quarter, and Denico Autry was able to get himself a sack of the coverage type in the third quarter. Grover Stewart completed a sack — though he didn’t get credit for it — when Mahomes lost control of the ball and was forced to fall on it, and Kenny Moore was able to earn himself a couple more as well. Any way you look at it, the Colts’ front four was not able to consistently get pressure on the Chiefs’ passer. The coverage downfield improved in the second half, but pressure after four or five seconds of waiting for a receiver to open up, isn’t really pressure. As we all witnessed, getting pressure on the opposing quarterback is king. The Chiefs were able to generate it on Luck and get in his face all night, and the lack of offensive efficiency proves that. The Colts weren’t able to do that consistently on Mahomes from the interior and that allowed the Chiefs to build an insurmountable lead. The Colts’ receivers had 5 receptions on their final drive of the first half. That was, without question, the most production the group showed in the first 30 minutes of the game. In their first 4 possessions before that, combined, the Colts’ pass catchers only hauled in 2 catches. In the second half, they could only manage to bring in 12 more catches, and Hilton was able to turn one of those into a very nice touchdown grab. Additionally, the Colts hauled in 5 of those 12 second-half catches in garbage time on their final possession of the game. For the most part, the Colts receivers were out-muscled and just flat out out-played from the snap. This group will be an area that gets a lot of attention heading into the 2019 season and will need another legit weapon in order to work towards the group becoming a strength which it clearly was not this season. One of the guys who had been getting pumped up since the opening of training camp, and legitimately earned all of his praise throughout the year was Kenny Moore. Moore showed that despite his stature that he could not be overlooked as an excellent cover corner. He matched up well against several team’s No. 1 receivers throughout the season, and played them tight and tough. He’s shown that he is one of the most physical guys in the Colts’ secondary, and that he can be counted on to be one of their premiere defenders into next season. The undrafted free agent was second in total tackles tonight for the Colts, totaled two sacks and had knocked down a pass on another blitz from the slot as well. Look for Moore to be getting a lot of praise as the 2019 season begins to get closer.